‘You wont know the shape of your unravelling until it happens’ says Rachel Lindsay’s disheveled comic avatar, sitting on her bed in a breeze-block room of the mental hospital to which she has just been committed. ‘But you probably have some idea what it looks like’ adds her previous corporate self, from the advertising office where she was in charge of marketing antidepressants. Rachel’s fall has been sudden and dramatic: from well-paid, corporate ‘suit’ to ranting unemployed maniac, shouting obscenities at authority and at her concerned parents. 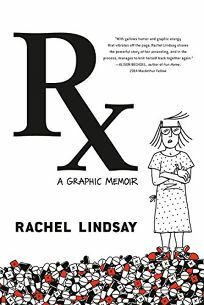 It is not often, nowadays, that I find myself unable to put down a graphic novel, but it happened with ‘Rx’ (the title being doctor’s short hand, standing for the latin ‘recipe’, that appears on a prescription). Starting at the point of her committal, then winding back to the events leading up to it, the story is a page-turner from the off, hustling the reader through 256 (unnumbered) pages in a whirl of tragi-comic mayhem, by turns hilarious and poignant. The pacing is faultless, the cartooning masterful. I read the book in one go. Rachel has a dilemma: she suffers from bipolar disorder and needs regular medication to stabilize her mood. In order to benefit from health insurance and have the resources to pay for medication she needs a regular job. Her regular job is as a pharmaceutical advertising executive, pushing antidepressants to unhappy people with whom she identifies, seeing herself reflected in the adverts she helps create, while her heart is, actually, in music and comics. The irony of working for Big Pharma in order to get treatment is acute, and Rachel keeps her illness a secret from her colleagues while feeling sickened by her role in the industry. The manic episodes catalog the textbook signs of the illness: weight loss, elevated mood, pressure of speech, excessive spending, flight of ideas and extreme irritability. Healthcare professionals could learn from this book. Lindsay represents the illness as a dark scribbled shadow, reaching towards her from the edges of the panel. The story is limited to the immediate events surrounding Rachel’s ‘ascent into madness’, her enforced stay in the mental institution, and her eventual release. There are no wistful flashbacks to childhood, no mid-story digressions into the etiology of bipolar disorder: we dive straight into the action and stick with it. Much of the story told in immediate scene action and dialogue, interspersed with short stretches of ‘voice over’ narration. The very occasional thought bubbles mainly contain images rather than words, a nice touch, and whilst the page and panel layout varies considerably, it coheres to a satisfying whole. Rachel’s cycling moods are easily recognizable and the drawing, clear black and white line with occasional hatching and plenty of black fill, employs a the visual lexicon of comics to delightful effect. To someone working in the UK health system, where the advertising of prescription drugs is banned (for now) and where healthcare is free at the point of access, and prescriptions subsidised or free, the US system seems outrageous. The cost of medication, the working-in-a-job-one-hates to get insurance is an anathema. I want to push books like this (and a handful of American cancer narratives) into the hands of politicians who wish to ‘stimulate a health insurance market’ that mimics the American model and shout at them: ‘Is THIS what you want?’. At our recent Graphic Medicine conference in Vermont I moderated the session in which Lindsay gave a short, and very polished talk about the book. Maybe the spell as an advertising executive lent some useful presentation skills. Criticisms? I can’t think of many… Page numbers would help academics cite the comic as they undoubtably will want to do, but hey – we don’t make comics for academics, do we? I really do love this book. It is a winner.